Are you looking for the ultimate list of travel gift ideas for kids? Then you have come to the right place! In our house we LOVE to travel…the kids as much as the adults. We love how their eyes light up with amazement when they encounter something beautiful in a new place or when they face a new challenge head-on like snorkeling in the Caribbean or walking across a swinging bridge in Kauai. We try hard to take the simple path when it comes to gift giving with our children as we would rather spend our hard earned money on travel and experiences than on more toys to fill our shelves. But we do still love to see their eyes light up with joy on Christmas morning too. So, for us, giving them gifts that contribute to a new trip coming up or to teach them about a new place that we are going to travel is the best of both worlds. This post contains affiliate links. Should you make a purchase through a link, I will receive a small commission at no additional cost to you. As always, we only recommend products that we absolutely love and think that you will too. Below is a list of our best gift ideas for kids who love to travel. Tried and tested by our own crazy crew, these are all favorites that we hope you love as much as we do. Included on this list are ideas for kids of all ages, travel gift ideas for toddlers, preschoolers, and older children. It is no coincidence that I put these books as #1 on our list. They are so simple, so inexpensive, and have the ability to entertain my children for hours on a plane or road trip. They are no mess, hassle free, and from our experience work for kids of all ages starting at age 1. 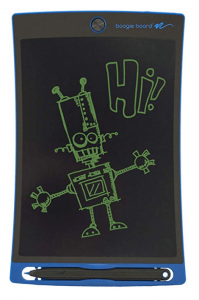 Boogie Boards are another fan favorite in my house. They work as a digital notepad and can be used to scribble, practice letters, play tic-tac-toe or hangman, and for good old fashioned doodling. They erase with the push of a button which means no loose paper sheets to track. Also, the digital button aspect gives it the cool factor. These are must have when packing our airplane carryon. As a side note, I can also vouch for excellent customer service from the manufacturer. When we first purchased three boards, one of them stopped erasing within a few days. I sent a quick email and received an immediate response and replacement board with ease. I also recommend splurging for the case. It keeps the boogie board protected and also makes it much easier to keep track of the stylus pen. This is one of those toys that is so simple, it’s silly. But it can entertain my children for days. They make jewelry, shapes, letters, and creatures out of it. They create a design and then challenge each other to try to figure out how to recreate it as fast as they can. It is so compact that it doesn’t take up any space at all. The pieces are small when separated though so not for young children. 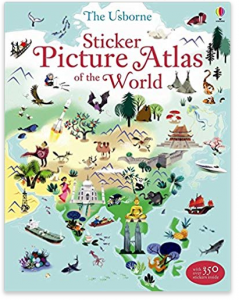 Perfect for a stocking stuffer for a child who loves to travel! 4. 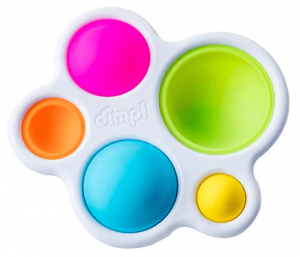 Dimpl This toy didn’t exist when my trio were babies, or if it did, I sadly missed out on it. However, I have heard about it non-stop recently and parents are raving about its ability to keep their little ones busy on an airplane. It is inexpensive, compact, and has 5 star reviews. 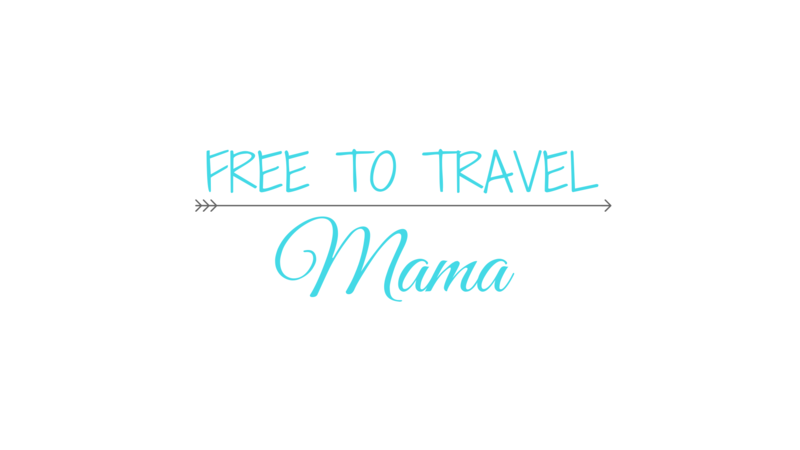 So its a no brainer in my book to try it out on your next plane flight or road trip with babies and toddlers! Another one of those new toys that I wish I would have known about a few years ago. According to toddler parents, this one is also a winner with keeping their toddler happy on a long flight or car ride. Our list of travel gift ideas for kids wouldn’t be complete without it. Inexpensive and not too big to squeeze into a carryon, makes it a great option to bust out as a new toy to entertain for hopefully more than 5 minutes! I can’t say enough about these cute little dudes! I even find myself playing with them once in awhile! We have had them for years, they still look brand new, and my boys still love to play and pack them for trips. 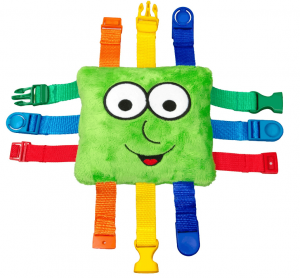 Our favorite things about Sprig toys are that they are small enough to pack in a carryon but big enough that they are mostly safe for little ones (with supervision for the littlest ones) and won’t get lost if (or should I say when) they are dropped on the floor in the airplane. They are easy to clean, eco-friendly, and extremely durable. They will entertain during travel, but can then hold up to being buried in the sand on the beach, going for a dip with you in the swimming pool, or driving through the mud on a hike. Varieties include Eco Fred Shred Skateboard, Dragonsfly’s Heloscoopter, Adventure Scuba, Chuck Boomer’s Glider Patrol, and Edmund Adventure Guide. We own them all! Which is your favorite? Small, easy to pack and hard to lose, buckle toys were our life saver when we flew four hours with 18 month old twin boys (and a 4 year old). The colorful aesthetic and challenging task were enough to keep them busy for several minutes at a time over and over again. Buster is green, and his friends Bizzy, Bella, and Bongo come in different colors. 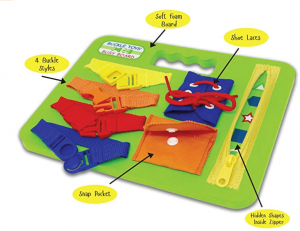 Made by the same brand as Buckle Toy Buster, these busy boards are fun for those learning to lace and tie as well. It is 8×11 in size so fits perfectly in a backpack and has enough variety to entertain children for quite some time on a road trip or plane ride. Small, easy to pack, and tons of fun for all ages. This game has entertained us many times as we traveled and the graphics are cute and engaging. My kids usually spend most of their travel time drawing, playing card games, and dreaming about their upcoming trip while staring out the window and squealing during plane liftoff. But sometimes it is just time to break out the technology. This reasonably priced tablet has an 8″ display, 10 hour battery life, and comes in blue, pink and yellow. 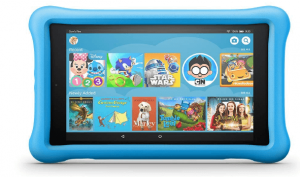 It holds thousands of apps and games, videos, books, and soon Audible books to keep your kiddos happy and busy, especially when flying overseas. We haven’t used these yet, but these are at the top of my 5 year old son’s Christmas list this year. They are made for kids but have clear, well-functioning 8x focus. They are foldable, shockproof and have a carry case. These would be a blast for any kid to take on their trip to wear on a whale watching trip or try to spot monkeys in the tree. I don’t know about you but my kids LOVE their flashlights. They are obviously most useful on camping trips, but they also love to read with them under the covers at night or do do activities in the car on a late night drive. If you want to take it up a notch, I highly recommend these headlamps. We gifted my daughter with her first camera when she was 7 years old before we left for a trip to Hawaii. To say she was thrilled would be a huge understatement. She clicked that shutter to her heart’s content all week long and then came home to make a scrapbook (which she entered into the county fair and won first place!). 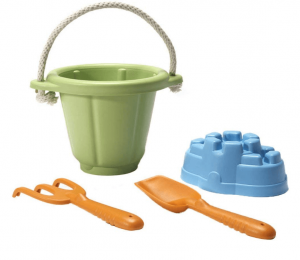 There are SO many options out there, but we are fans of this one – simple to use, a good size for little hands, and not too pricey in case they drop it on the rocks! Heading somewhere fun? How about giving each of your children the gift of a special activity that they would love? Maybe a special animal encounter at an aquarium on the Pacific Coast or ziplining with Dad in Costa Rica? My sister is heading to Hawaii in February so each family member is receiving one gift of their wish list and one certificate for an experience on their trip. Sand Toys may take up too much real estate in your luggage for a plane flight, but for a driveable beach vacation or roadtrip, my guess is that they are on your packing list. 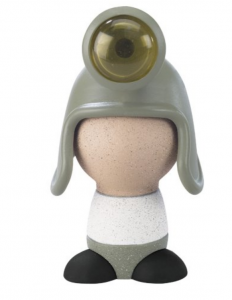 We are complete Green Toys fans and love everything they make out of recycled milk jugs. My children also have their tea set, helicopter, boat, plane, and kitchen set and have played HARD with them for about 7 years. Despite all the bubble baths, beach days, camping trips, and backyard experiments, they still look new! Super durable and easy to clean, they are a must have in our book and our favorite thing to give as a gift. This is on my children’s gift list this year. 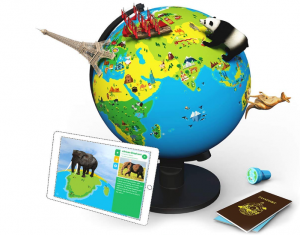 It interacts with most iPads and smart phones to teach children about other places and cultures in a fun new way! We love, love books in our house! 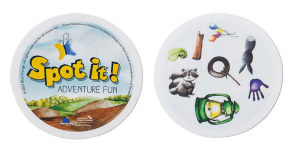 When it comes to books that are fun travel gift ideas for kids, the options are endless. Here are just a few of our very favorites! Activity books and engaging novels keep my kids busy and learning for hours on end when sitting at the airport, on a plane, or driving 500 miles to see their cousins. There are 9 books in this series including, Paris, Barcelona, Rome, Washington D.C., London, New York, Amsterdam, St. Augustine, Florence. 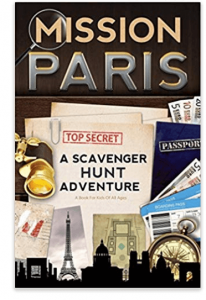 We love this series about boy and girl twins who travel the world with their travel writer parents solving mysteries in each city along the way. It is an easy read for younger children or early readers. My 5 year old twins love their adventures! My daughter loves American Girl so we try to find a new one to read whenever we can. She absolutely loved reading about Grace who travels to Paris and about Kanani when we went to Kauai. These journals are great gift ideas for remembering precious memories. We especially like this one or this one. I happen to think that water bottles that don’t leak are worth their weight in gold. Who’s with me? Luckily our favorite Thermos Funtainer Bottles don’t cost nearly that much. Each of our children has a few of these, we have given them as gifts, and have recommended them more times than we can count. They offer them in several colors, with characters, and also in two sizes (12oz and 16oz). My children use these everyday and we literally don’t leave home without them. 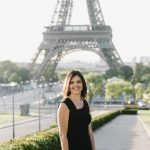 I love having a new outfit or two to take on a trip with me and my kids do too. We love to pick up a few new things before we travel that suit the climate and activities of where we are headed. Sometimes a new winter jacket or warm base layers are a necessity for a trip. Other times we just pick up fun things like surfer themed shirts and a pineapple dress for our trip to Hawaii or personalized Disney shirts for an adventure at the happiest place on earth. My kids love picking up a special treasure or two on each trip to bring home. They often pick something small like a fancy rock, a bracelet, or some other hand made item from that country. You could wrap up a little wad of cash for them to add to their piggy banks to bring and choose a special momento to buy with their own money. We hope you find some new and great travel gift ideas for kids to add to their wish lists! Have any ideas that you don’t see listed above? Leave me a comment and let me know! 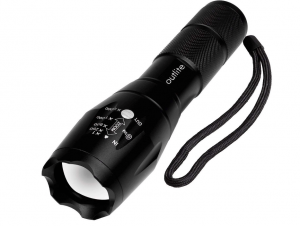 The flashlight… so much yes! That was our toddler’s absolute favorite thing on our beach trip last week. Every night we went out on the sand to “hunt” for crabs with it… tho I think he liked the flashlight more than the animals! So true! It’s always the little things, isn’t it? Great timing as I have some kids to buy for and I want to inspire their wanderlust. Great! I love instilling a sense of adventure in my children. They all love it as much as I do and I look forward to our future travels! Great ideas – thanks for the tips! That point and shoot camera and the binoculars would have been my absolute favourites when I was a kid! Great ideas for keeping kids occupied and excited about travelling! 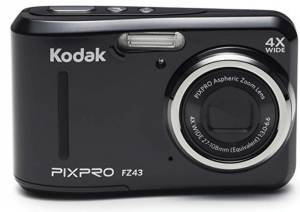 I love the idea of giving a child an inexpensive point and shoot camera! In addition to keeping the child entertained, I think it would also be really interesting to see your trip from the eyes of a child! My fiance’s nephew is just getting to the age where he’s starting to be able to travel more without relying 100% on adults to take care of him, and I think he’d really like having his own suitcase! 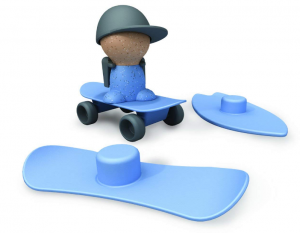 That’s a really cool list of travel gifts for the little ones! 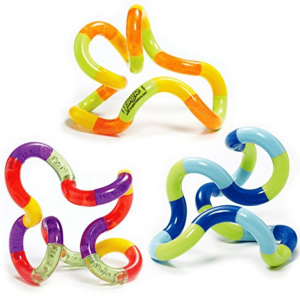 I absolutely love Twisty Tangle, I can imagine keeping a kid entertained with one of those. I’ve also realised that an iPad really helps haha. The Adventure Fun Card Games also looks cool. Yes! Travel Journals are great for adults too! It’s a bit too early for me to start thinking about this but this is one awesome list. 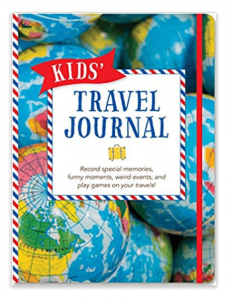 Those travel journals for kids look really cute! The binoculars were my favorite when I was a kid too. Thank you for sharing this list. I know some travel-loving kids, so this is great to give some ideas for suitable gifts. I particularly like the binoculars (as I’m a safari fan, and this encourages kids to look at flora and fauna even if they’re not on a dedicated wildlife holiday). Am also loving the kid-friendly camera, (as I got into photography as a child). So many great ideas. Love the Orboot Globe, looks cool. What great gift ideas! I often think of travel gifts for adults but forget about the little ones. Toys that keep them busy without making a lot of noise are great. And the water bottle, flashlight, etc. are useful too. Thanks for suggesting all the adorable ideas for best travel gifts for kids. I would love to gift binoculars and shoot and point camera as they can be used very well during travels and kids would love to use them during travel. Picture Atlas is also a good idea to introduce the world to tiny tots. Wow a great pics specially for someone like me who travels with kids. Can get difficult on those long flights to keep them entertained. Looking at the list the Fire Tablet and the Kodak point and shoot are the winners for my kids who are a bit older. Thanks for sharing. The carry on suitcase is the best among others. No matter what’s the age of your kid but when they can walk by themselves, having a small suitcase develops a sense of individuality and looks so cute actually. Loved the list. The Twisty Tangle looks so cute! My niece would definitely pick this from the list. I’ll definitely order one before Christmas. She’ll like it! I’m so glad to introduce you to something new! I hope she loves it as much as my kids do! I am all about saving most of the money for travel/experiences. When I have kids someday I’d like to also gift them items that have to do with our next destination! Great ideas! Such a great list, especially all those toys for keeping kids entertained on a long flight. A small camera is such a great idea as well for kids not old enough for a smartphone.. I’m making photo albums as gifts for Christmas this year and a camera would be a nice add-on for my little niece. Thanks! My children absolutely adore having their own cameras. 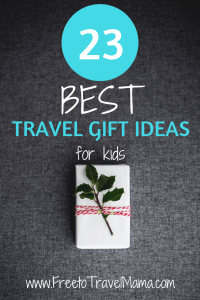 This is a great travel gift guide for kids, and aptly timed too! 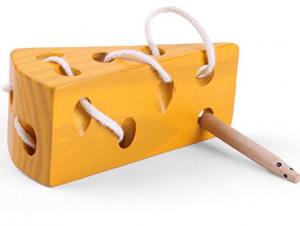 My niece would love the cheese string toy, what an ingenious design! I bet many young children would be happily occupied for a while when traveling. I’ll be sure to share this with my friends with children too. As a former Early Childhood Educator, I really love how a lot of these gift ideas are educational and help to develop skills in lots of areas of child growth. Really nice to help encourage learning during travel! I LOVE this list! So many great and practical ideas! Perfect for some great Christmas gifts. My kids have had the Boogie Boards for a couple years now and we never go on a trip without them. They love to draw something they see and have the other guess what it is. We also love and use the Thermos Funtainers almost daily! 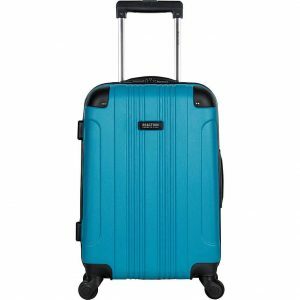 My oldest is just turned 12 so I see a carryon size suitcase in his near future, maybe even for Christmas. I didn’t even think about that until I read this post. Thanks so much for the great ideas. Thank you for the great feedback! This list was carefully chosen and I love hearing that some of these are favorites in your house too! I love this post! A favourite in our house is the Mellisa & Doug Water Wow too! I have not heard of the Twisty Tangle before either. I think my kids would love that! Thank you for sharing so many helpful items for travelling with kids! Love it! Thanks for the feedback! 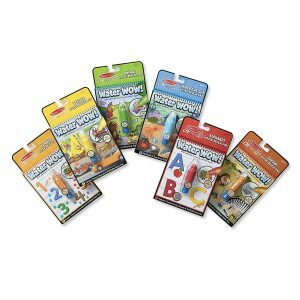 My kids definitely love their waterwows and twisty tangles too! Wow, such an amzing list of gifting ideas for little ones! I do not kids myself but this is definitely going to be a great help when it comes to gifting little ones in the family and friends kids. Some are really interesting toys to the kids occupied in long haul flights. Thanks for the share. Thanks! All of these toys are our favorites and a life saver for long flights!